About 80 percent of workers say they’d like to work remotely at least part-time. As more U.S. workers shift toward remote schedules and the “independent contractor” lifestyle becomes more popular, schools are also beginning to experiment with student “work from home” days. With these “Virtual Days,” students can learn time management and self-management skills before they enter the workforce. As more colleges offer online classes and mass online courses adapt to the digital learning environment, students, teachers and administrators must learn how to blend their classroom experiences with face-to-face and virtual meetings. Schools are prepared for inclement weather and emergency at-home days. Instead of losing instruction days, students and teachers alike are ready to work when they can’t make it to school. Some school districts with frequent snow days have already implemented this as a regular strategy. In addition, closing school buildings and eliminating transportation can save significant dollars. Teachers must still be paid, of course, but facility costs and utilities are lower when everyone works from home. As school districts begin to adjust, however, some policies still restrict school flexibility and the hours that students are required to be on campus. To better embrace virtual days, state and district policies will need to change their funding formulas. At the same time, mandatory virtual days could burden working parents who aren’t able to be home with their students, adding costs for daycare, afterschool care and meals. In some districts that have experimented with virtual days, parents have also commented that their kids are missing socialization opportunities. Virtual days could doubly impact lower-income families that don’t have adequate utilities or meals at home. Paired with that, students need Internet access for these virtual learning environments, which rural areas may lack. On the school district side, online learning management systems need the bandwidth to handle hundreds or thousands of users at one time. During a recent snow day, a school district’s server crashed when students tried to log in at the same time. Finally, school administrators are still cautious about academic outcomes when it comes to virtual learning days. The flexibility may be helpful at times, but virtual days and worksheets can’t replace in-person interactions with teachers and fellow students, especially for hands-on science labs in physics, chemistry and biology or verbal-dependent reflections and conversations in English, theater and public speaking classes. 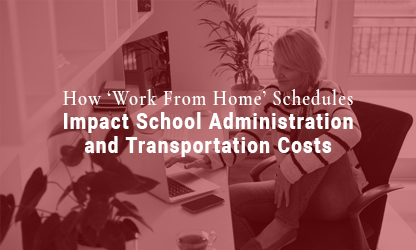 With transportation costs in particular, “work from home” days affect routing, scheduling, and drivers’ work days. Some districts have experimented with half-days, for instance, where students use the afternoon to work independently from home. Although it may help students, it changes when and how routes run on those days, especially if the buses must complete morning runs and then turn around and complete early afternoon runs. In addition, districts may face conflicts with drivers’ contracts if they cut school days, and drivers become at risk of earning lower pay. At the same time, potential savings must also be considered. By planning several full days off, for instance, a 7,000-student district in Minnesota saved $75,000 by not opening buildings or running buses on four “flex-learning” days. In all, these days are becoming more popular for experimentation as the real-world workforce shifts further toward remote work, but school districts may struggle with the best ways to balance savings, costs, employee contracts, transportation schedules and statewide funding formulas.